Wookiees are an anthropoid species native to the planet Kashyyyk believed to be descended from tree-climbing mammalians. Tall, strong, and covered by soft, thick fur, Wookiees are known as ferocious opponents and loyal friends. 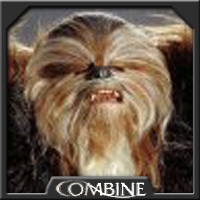 The average member of this species grows to over two meters in height and has a much longer life expectancy than a human with the average Wookiee having a lifespan of several centuries. Wookiees also have impressive regenerative abilities that allow them to recover from injury at a remarkable rate. As tree dwellers, Wookiees have wickedly curved claws that pop from hidden fingertip sheaths with the flex of a muscle. With the aid of these claws and their strong limbs, Wookiees can travel through the upper reaches of the great wroshyr trees of their home world, clinging to vines and branches with agile ease. While feared as opponents, Wookiees employ no obvious fighting style. They seem to simply charge forward, arms swinging, shattering whatever they hit with their huge, powerful fists. Wookiees never use their claws in combat, however, as this is considered a serious breach of the Wookiee code of honour. Shyriiwook, the Wookiee language, is made up of a series of grunts and growls. They can understand other languages, but their limited vocal ability makes it impossible for them to speak anything other than their own language. On Kashyyyk, Wookiees live in cities situated high within giant trees. Though they appear to be primitive in nature, they are quite comfortable with high technology, combining natural features with modern conveniences this lead to them being perceived as a species more in touch with the Force, due to their integration of nature and technology. Wookiees have a primitive patriarchy with a complicated lineage structure, initiation rites, and a religion that rejects materialism. One of the most important Wookiee customs is Life Day, wherein extended Wookiee families gather and celebrate a day of joy and harmony, as promised by the Tree of Life. Even the Imperial blockade could not keep Wookiees from recognizing this most important day. Wookiees greatly value morality, courage, compassion and loyalty. A sacred and ancient Wookiee tradition is that of the honour family. An honour family comprises a Wookiee's closest friends and companions. These family members pledge a commitment to lay down their lives for one another, as well as members of any honour families these individuals may have. Like the similarly sacred Wookiee life debt, Wookiees extend this tradition to members outside their species.